Spring is here and that also brings with it Softball/Baseball/T-Ball season in our house. Of course that also means lots and lots of sports equipment. Uniforms, bats, balls, gloves, bags, shoes, and helmets. All of which needs to be labeled so it doesn’t get lost. Typcially we just use sharpie to label their equipment, but their helmets is a different story. In order to make theml a little more custom, we always add their names and team logo to their helmets. 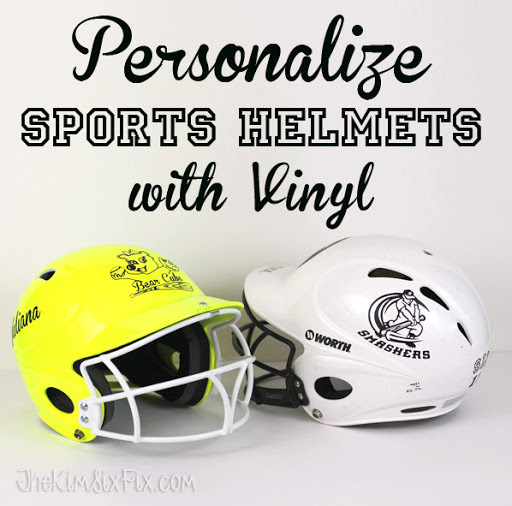 You can buy helmets already painted in team colors, or you can colored striped decals and standard Major League Baseball Logo Decals but it is a lot harder to find something custom. I’m pretty sure the 'Sparkle Shines' isn’t a logo you can pick up on Amazon. I also had the problem that we reuse the helmets year after year so I needed a solution that would only be semi-permanant. I didn’t want to stencil or paint them. The solution was obvious: Custom vinyl decals cut on my Silhouette Cameo. You can buy semi-permanant vinyl (Oracal 631) which will come off easily. (I even used permanent vinyl last year (Oracal 651) and, as you will see below, I was even able to get that off a year later. It was actually a fun little project, and only cost me a couple dollars. If you don’t have a Silhouette or Cricut machine, you can buy stock decals online. Now if only batting practice were so easy!